Problems of secure communication and computation have been studied extensively in network models. Goldreich, Goldwasser, and Linial, Franklin and Yung, and Franklin and Wright have initiated the study of secure communication and secure computation in multi-recipient (broadcast) models. A “broadcast channel” (such as ethernet) enables one processor to send the same message—simultaneously and privately—to a fixed subset of processors. 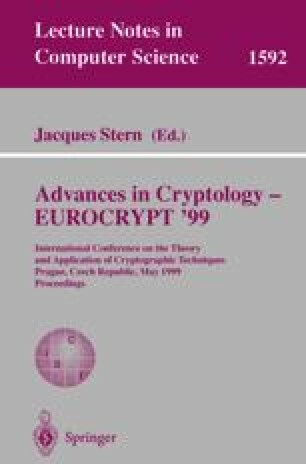 In their Eurocrypt ’98 paper, Franklin and Wright have shown that if there are n broadcast lines between a sender and a receiver and there are at most t malicious (Byzantine style) processors, then the condition n > t is necessary and sufficient for achieving efficient probabilisticly reliable and probabilisticly private communication. They also showed that if n > [3t=2] then there is an efficient protocol to achieve probabilisticly reliable and perfectly private communication. And they left open the question whether there exists an efficient protocol to achieve probabilisticly reliable and perfectly private communication when [3t=2] ≥ n > t. In this paper, by using a different authentication scheme, we will answer this question affirmatively and study related problems. Research supported by DARPA F30602-97-1-0205. However the views and conclu- sions contained in this paper are those of the authors and should not be interpreted as necessarily representing the official policies or endorsements, either expressed or implied, of the Defense Advance Research Projects Agency (DARPA), the Air Force, of the US Government.